Together with CAMS developer David A. Jobes, Ph.D., ABPP, you will work to apply the CAMS Framework with a Kevin O’Leary, a fictional patient at high risk for suicide. Unit Two sets the stage before you begin working with Kevin with Dr. Jobes, so you’re more familiar with CAMS. 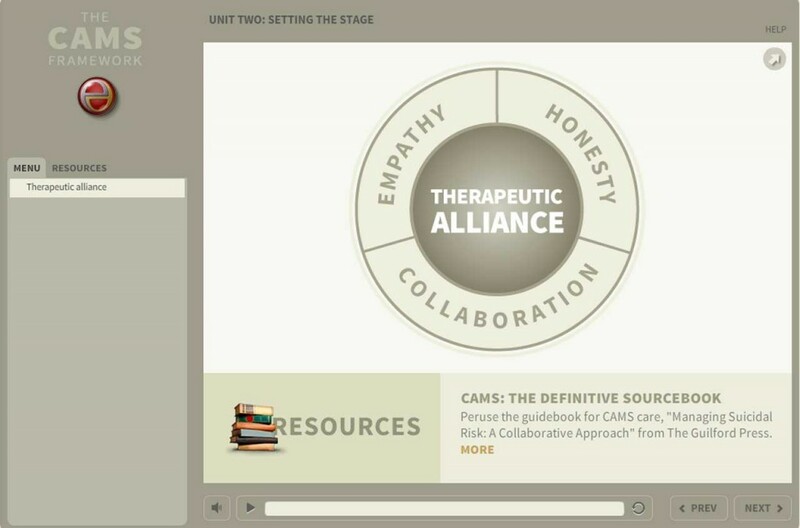 In Unit Two you’ll learn about building a strong therapeutic alliance with your suicidal patient, and what CAMS offers to help you do so. 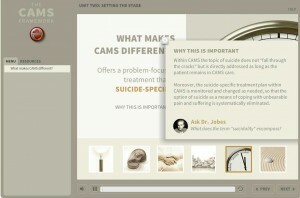 You’ll also be introduced to the CAMS Suicide Status Form, or SSF, a multipurpose roadmap that guides you and your patient through CAMS clinical care. Links throughout this training help expand your knowledge and gain new understanding! Discover RESOURCES to support your work with suicidal patients. Hear CAMS Developer David Jobes in EXPERT INSIGHT links, as he shares knowledge gained over 25 years of treating people at risk for suicide. Engage in interactive ACTIVITIES to practice what you’ve learned. And EXPLORE within the course and outside of it with links to research, screening tools and more. In this unit you'll learn what sets CAMS apart from common approaches to treating at-risk patients, and how this suicide-focused approach helps them move toward resolving their suicidality. 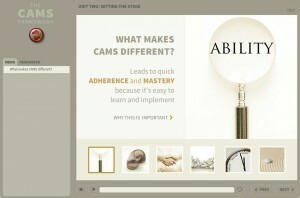 Click on the images to the left to learn more about what makes CAMS different—and why these differences are important to improving patient outcomes for practitioners and heath care systems.